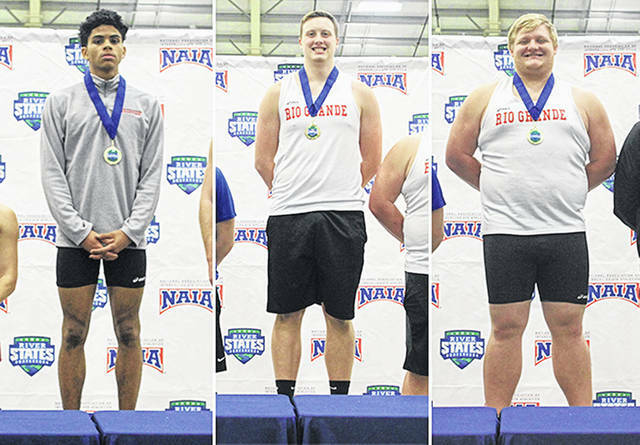 From left to right, Rio Grande’s Keshawn Jones, Zachary Collins and Joseph Beegle recorded first-place finishes for the RedStorm during Friday’s River States Conference Men’s Indoor Track & Field Championships in Tiffin, Ohio. TIFFIN, Ohio — Keshawn Jones and Zachary Collins set new meet record in their respective first-place finishes, while Joseph Beegle captured an individual title of his own to fuel the University of Rio Grande’s performance in Friday’s River States Conference Men’s Indoor Track & Field Championships hosted at Tiffin University’s Heminger Center. Jones, a junior from Mansfield, Ohio, captured top honors in the 1,000-meter run with a time of 2:36.11, while Collins – a junior from Newark, Ohio – won the weight throw with a heave of 15.14m. Beegle, a junior from Racine, Ohio, placed first in the shot put with an effort of 14.38m and also finished as the runner-up in the weight throw with a toss of 13.93m. Rio Grande finished fifth as a team with 85 points. Point Park University defended its championship with 156 points, while Indiana University East (142 pts.) and Cincinnati Christian University (119 pts.) rounded out the top three. Point Park’s Michael Morris was named Field Athlete of the Year. He placed in all three jumps, taking second in the high jump, third in the triple jump and sixth in the long jump. He was also sixth in the 60-meter hurdles to total 20 points on the day. Seth Reynolds and Will Mundy led IU East to its runner-up finish. Reynolds was selected Track Athlete of the Year after scoring 24.5 points. He repeated as 60-meter hurdles champion, placed second in the 400, fifth in the 200 and led off the winning 4×400 relay. Mundy was named RSC Newcomer of the Year with 22.5 total points scored. He won the 200 and the 400 running NAIA ‘B’ standards in both and also anchored the first-place 4×400 relay. Point Park’s Kelly Parsley repeated as Coach of the Year. Rio Grande recorded 11 other individual showings and two relay teams which contributed to the overall point total. Among the RedStorm’s other top individual showings were from freshman Denoah Wright (Ravenna, OH), who was the runner-up in the 60-meter hurdles with a time of 8.65; sophomore Dean Freitag (Magnolia, OH), who was fourth in the 3,000-meter race walk after crossing in 14:12.53; junior Daulton Duvall (Flatwoods, KY), who was fourth in the weight throw with a toss of 13.32m and seventh in the shot put with a heave of 12.80m; senior Kameron Carpenter (Newark, OH), who took fifth place in the 5,000-meter run with a time of 16:48.66; sophomore Isaiah Lester (Gallipolis, OH), who placed fifth in the 600-meter dash with a time of 1:29.52; freshman Fabio Inaba (Sao Paulo, Brazil), who finished sixth in the 60-meter dash with a time of 7.38, eighth in the 200-meter dash after crossing in 23.96 and ninth in the long jump with a leap of 5.62m; junior Ethan Greenawalt (Orlando, FL), who was sixth in the 3,000-meter race walk with a time of 20:31.21; junior Adam Champer (Malvern, OH), who was sixth in the shot put with an effort of 12.95m; sophomore Mohamed Farah (Galloway, OH), who was eighth in the 3,000-meter run with a time of 9:53.61; and sophomore Trace Conley (Minford, OH), who placed 10th in the shot put with a toss of 11.84m. Rio’s 4×800 relay squad – which was composed of Lester, Farah, Greenawalt and Jones – placed fourth in a time of 8:54.69. The 4,000-meter Distance Medley Relay team – made up of junior River Spicer (West Milton, OH), Freitag, Lester and Carpenter – placed sixth in a time of 12:25.58.